Absolver is a Martial Arts based Online Action RPG, set in the ruins of a fallen empire. Based purely on technical melee combat and extended through traditional martial arts weapons such as short swords and staffs. A unique title in development by Sloclap. An independent studio based in Paris, founded in 2015 by veteran designers, programmers and artists from Ubisoft. There are a few different fields that this game will be pushing when released. However, only if it meets the current expectations that it has set. For one, such a game will be best played using a gaming controller. The dexterity and finesse required to play and perform well cannot be had using a mouse and keyboard. This will further influence the PC gaming community to accept the new tread of user input. Gaming controllers are simply superior for certain games. Gaming controllers will become a common staple in the PC gamers toolkit and will lead the PC to become the ultimate gaming console. Gamers want difficult high adrenaline close combat and this has been proven through action RPGs such as The Witcher 3 on Death March. It is no surprise, as melee combat has been deeply embedded in our DNA through out history. The urge for physical combat is prevalent in our culture, look at our sports. Being able to fight in a virtual world, govern by the same or similar physics of our own world is extremely appealing to any martial artists and traditional weapon enthusiast. Besides training and competitive combat, martial artists are not given any other avenues to practice and build muscle memory. Absolver definitely has the potential to fulfil this need and part of the excitement and anticipation comes from this major factor. However, how close the combat is to real world techniques (seems accurate) and how it will actually play and effect the players brain are things that we can only discover once released. With a unique art style, primal and elemental in nature; the creators have set a world that allows the imagination to take hold. While still abiding by real world proportions, environments and architecture. 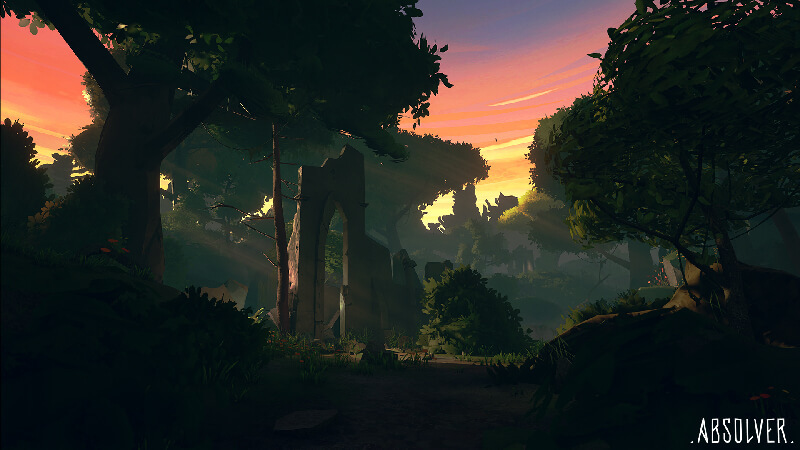 Built on the Unreal Engine 4, Absolver is visually engaging. Graphically it is much like Brothers: A Tale Of Two Sons (build on UE3). A very simple minimalisitc approach with rich colour palletes that run well on a range of hardware. The game will feature both PvE and PvP elements, though by nature, PvP may take on a greater role. While the PvE is the learning tool where the player becomes familiar with the mechanics, builds confidence, makes friends and obtains gear to compete in the dedicated PvP arenas. 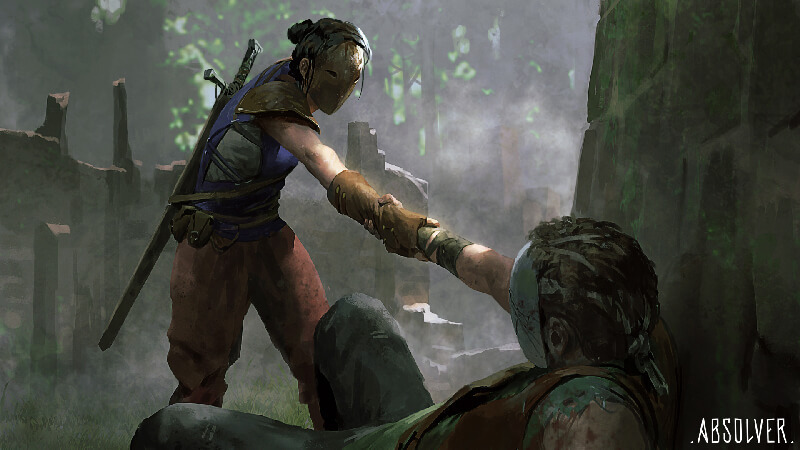 Absolver is set in an open world with important NPCs, backstories ready to be uncovered and co-op dungeons to retrieve rare loot. Designed like Journey, players will encounter each other as they go about their way. And must decide on whether to battle, befriend another or simply walk away. This element of the game is exciting due to the uncertainty and tension involved when players meet. And more so, when they decide to co-operate with another. Since they can turn on each other at any point and break the fragile trust formed. Encounters will have lasting consequences (no further explanation has been given) and can transform into meaningful relationships, were you make friends or enemies and find mentors and disciples. To solidify this feature the game will have a friends and grouping system. However, the extend and process is currently unknown. Players gain loot as they defeat enemies, some of which being power-ups, healing items, armour and weapons. The armour is designed so that the player can mix and match them. However, there has been talks of set item bonuses. Weapons can break, be repaired and also disarmed during combat. While the game has shown us the short sword, gauntlet, staff and knife. Only the short sword and gauntlets are currently confirmed. Players will have a choice between four different combat stances, with their own tactical advantages and disadvantages. These are to be changed during combat in order to execute devastating attacks, dodges and parries to defeat ones enemies. The player is also able to custimise their their moves and formulate their own unique style of combat, based on a decking building system. To be effective and adaptable in combat the player needs have a deep understanding of the different styles in order to counter their opponent. Quick responses and agility in motion is key to take advantage of the opponents mistakes and guard against counters. This will be very testing to the player, much like real world martial arts and combat. A cool headedness is required to maintain focus and channel ones energy. Which leads us to the flow state mechanic. Perfectly timed executions of attacks and movements allow the generation of a shards. Which can then be consumed to make use of special force abilities like the shockwave. Once a relationship has been formed between players, they are then able to learn & transfer new moves using the Master/Student system. Where the Master performs a certain move on the Student during combat, which grants gradual points in the particular move in order to unlock it. How this will actually play out and whether Master/Student system will be active during the Arenas is unknown at this time. Which leads us to the final point of this article. 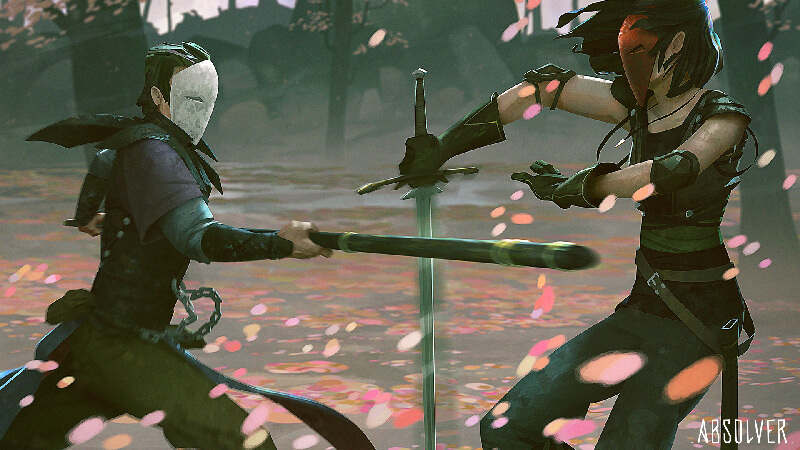 In Absolver, players will be able to fight in 3vs3 Arenas in addition to Dueling Arenas. The gains and performance from these competitions will impact the players position on the ladder system. Which is the path to lead the player to become an Absolver. There hasn’t been much more detailed given and we do not yet know whether additional PvP elements and competition will be added further down the development or after it’s release. However, it has been clear that PvP will play an extensive role in the players experience. Having had the privilege to be an Alpha tester has given me hands on experience of the game. And all I can say is that it is all I hoped for and more.. I am very excited for the release of this wonderful game and look forward to many hours of learning and mastery required to become an Absolver. This means that I will also be playing the game as a Beta tester (which is in final round) – Register Here. 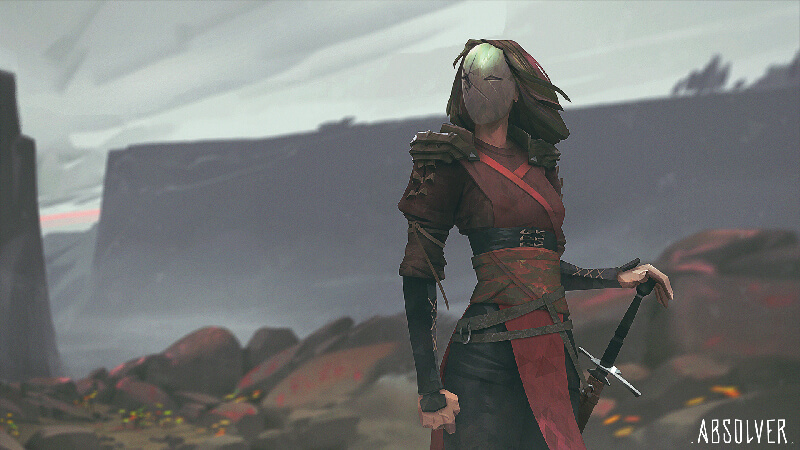 With an experienced 25+ man team behind it’s development, Absolver’s future is looking great. The games development has gained a following after it’s E3 debut and surprised many. If you wish to follow it’s progress, here are the links to it’s social media twitter, facebook and the website. To keep up to date with upcoming news and information, sign-up for my email updates. Until then!